Adam Cassidy: I'm not going to make excuses, I asked for this. All of it. And I did it to become someone else. And I wanted more. Cassidy and his friends work for Wyatt mobile and are pitching a new idea to the boss. He doesn't care for it and Cassidy gets arrogant. They're fired but for some reason he still has an active expense account credit card and they party that night. He also meets the pretty Emma. The next day, Wyatt wants to meet with Cassidy. He will get him a job with his childhood competitor Goddard so that he can steal Goddard's next big idea. He's got a behavioral specialist on board and sets Cassidy up with the good life and trains him. Cassidy gets the job and Goddard is impressed with his idea. And as it turns out Emma also works for Goddard. Everything is going fine until Wyatt's people become more pushy and want him to steal the future device from Goddard's corporate vault. Of course he's caught and with that Goddard wants to buy Wyatt's company or put him in jail, but Cassidy has some plans of his own. Paranoia has a lot going for a it- a decent budget, impressive cast, an OK story, good visuals. It even starts with some important discussion about how America has completely ceased being the country of opportunity it once was. The direction is poor and the script could have used some work. 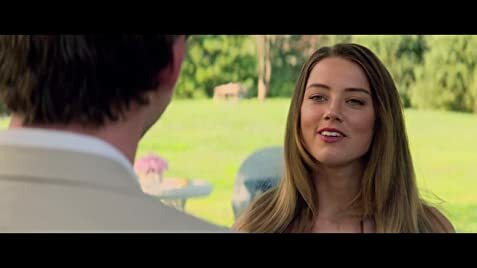 The movie's title is wrong or if they intended to highlight the moment of Cassidy's paranoia they failed. As a whole, emotionally, this movie is pretty flat. There should be a far greater sense of dread and danger. Perhaps it's because they went with a PG-13 rating. As an R-rated movie this could have been better. I get the sense that they aimed for a mature teen audience looking for a serious movie. And perhaps it would work for that crowd- not sure. 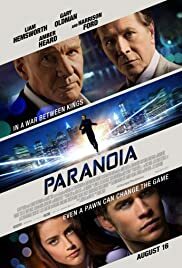 Paranoia had a lot of potential. I wanted to like this movie as the cast does a good job, except for Oldman's and Davidtz's obnoxious British accent. But the director did his best and succeeded at frustrating the audience and not giving us as good a movie as it should have been.